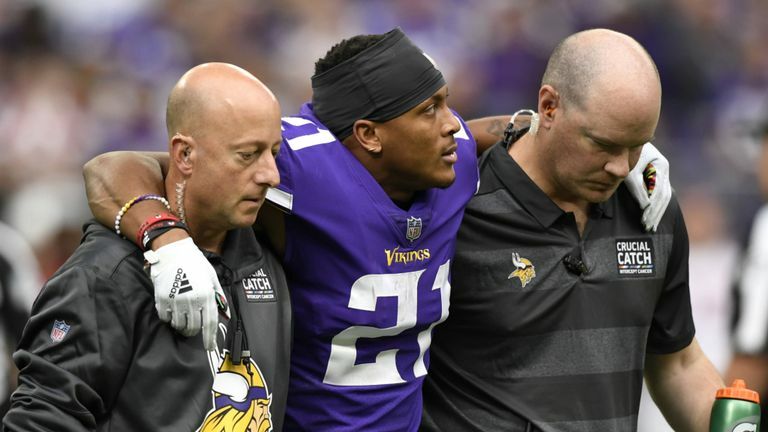 Coach Mike Zimmer confirmed Monday that Hughes’ MRI revealed a torn ACL, ending the rookie cornerback’s season, Adam Schefter of ESPN reports. Hughes, the Vikings’ first-round pick, suffered the left knee injury in Sunday’s win over the Cardinals. Hughes’ leg appeared to buckle when he dropped into coverage against Cardinals receiver Larry Fitzgerald with 8:59 to play. Hughes tumbled to the ground, grabbing his left knee, and was tended to for several minutes before being helped off by Vikings’ medical staff. His first NFL campaign will come to an end after just six weeks, during which the cornerback tallied 22 tackles, three pass breakups, an interception and a forced fumble. Hughes’ absence should open up more reps for Mackensie Alexander in the Vikings’ nickel package. Expect the Vikings to move Hughes to injured reserve later this week. This is the second year in a row that the Vikings’ top draft pick has been lost due to a torn ACL early in the season with 2017 second round running back Dalvin Cook doing the same in Week 4 of last season, not to mention some of the other notable knee injuries in recent team history. The rest of the Vikings depth chart at cornerback features Xavier Rhodes, Trae Waynes, Mackensie Alexander, Marcus Sherels and undrafted rookie Holton Hill. The latter three players will likely combine to fill the void, though a roster move involving a cornerback cannot be ruled out. Hughes was selected with the No. 30 overall pick in the 2018 NFL Draft out of the University of Central Florida, where he spent the 2017 season on a team that went undefeated and also featured one of the draft’s best stories in linebacker Shaquem Griffen, who would wind up being drafted by the Seattle Seahawks. Hughes began his career at the University of North Carolina and transferred to Garden City Community College after a year in Chapel Hill.